Crockpot Chicken Wild Rice Soup is one of my family’s favorites. 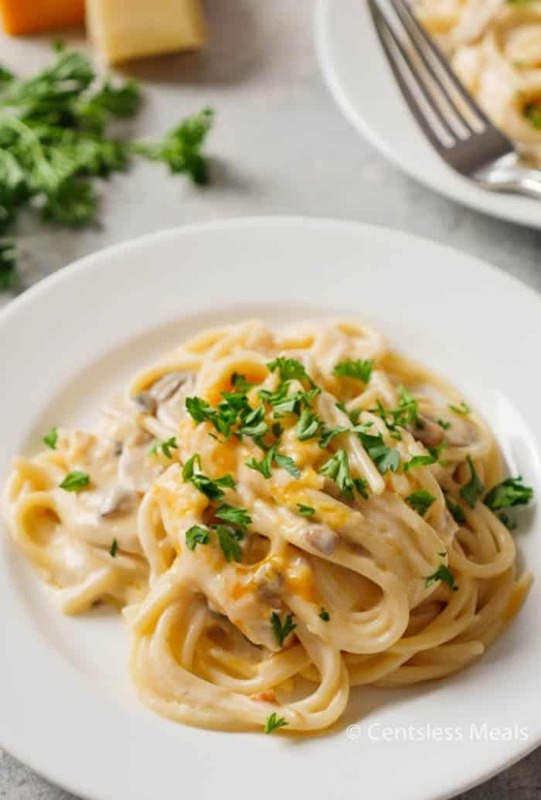 With its creamy richness and earthy flavors, it makes for the perfect comfort food for cold winter evenings. 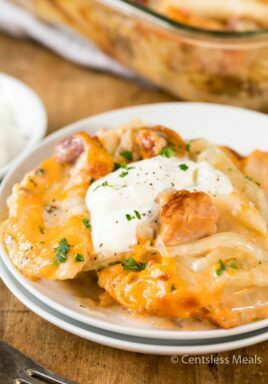 Plus, it’s super easy to make in the crockpot. Wild rice has a chewy, almost crunchy texture, and fits especially well into this soup recipe. As much as I hate the cold winter days, I also love them. I just love snuggling up in a blanket on the couch and warming up with food like hot chocolate, chili, and soup. 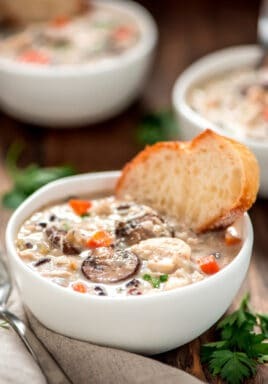 But what’s even better are recipes for comforting meals that are almost effortless like Creamy Chicken Noodle Soup and this Crockpot Chicken Wild Rice Soup. There is just something so warm and cozy about the combination of chicken, wild rice, and mushrooms. Don’t you think? One of my favorite ways to make soup is to cook it in the slow cooker. It’s so easy to just throw it all in early in the day before the kids get crazy and I get too tired. 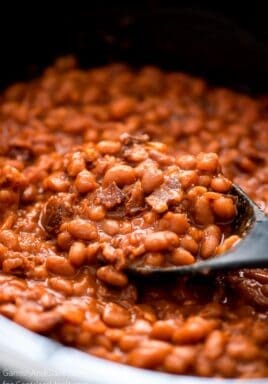 I also think cooking it low and slow helps the flavors come out more. Though I have to say, I think soup actually tastes better the next day because the spices and other flavors have had time to marry together. 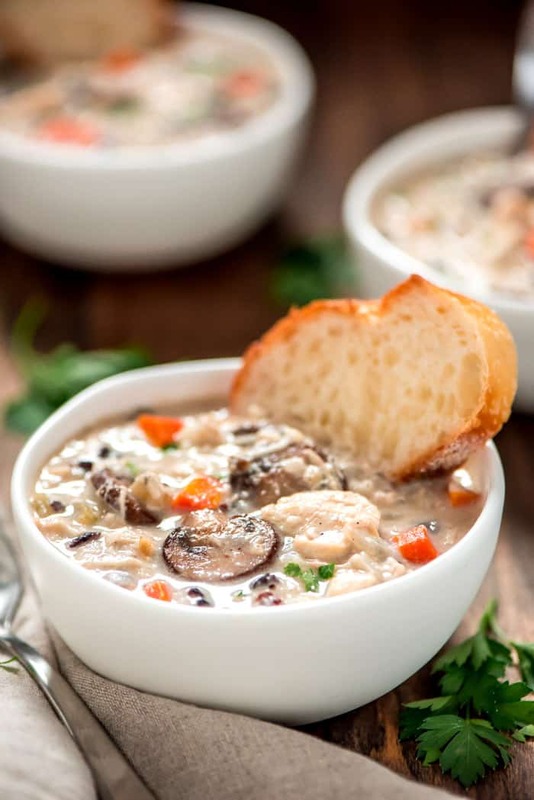 Chicken wild rice soup is the perfect dish for your crock pot and it requires minimal prep. 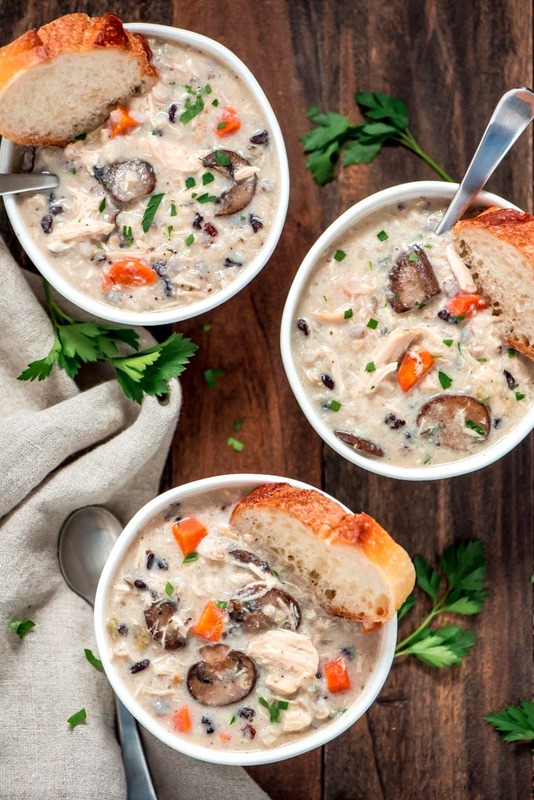 For this Slow Cooker Chicken Wild Rice Soup, you toss the chicken breasts, veggies, garlic, herbs, and chicken broth into the slow cooker and cook on low. After a few hours you then add mushrooms and rice (they’re added later so they don’t get mushy). Cook the chicken breasts with the broth in your crockpot until done. Add diced onion, carrot, celery and sliced mushrooms. Whisk flour with cream until smooth. Add the cream mixture and the remaining ingredients to the pot, and cook until the veggies are soft and the rice is done. When you need a quick dinner for those busy weeknights, thaw the soup in a pot. 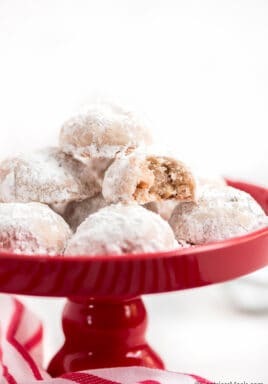 When it’s steaming, stir in the flour-whisked cream and milk. Your family will be glad you did! Chicken and wild rice soup is so creamy, dreamy and delicious that it makes a hearty meal all on its own. It needs very little on the side to satisfy your family. You could float some oyster crackers on the top for a satisfying crunch. Or, you might consider placing a “panera” in your centerpiece. Yes, we all know this is the name for the famous restaurant chain with the fabulous breads. But there’s a good reason why they adopted the word. Panera is actually Spanish for “bread basket.” So for this recipe, picture a rustic woven basket, overflowing with loaves of crusty bread. I can’t imagine a better dinner companion for chicken and wild rice soup! Can You Freeze Chicken Rice Soup? The only small drawback to chicken and wild rice soup is that it doesn’t hold up well to freezing. This is because it is a cream- and milk-based soup. The solids in dairy tend to separate out when thawed, giving a grainy, curdled texture to sauces or soups. This doesn’t affect the taste much, but some people find the appearance less than appetizing. But don’t despair! Try this: If your crockpot is big enough, double all the ingredients, except for the dairy and flour. When cooked through, ladle half into freezer containers (being sure to leave an inch of headroom for expansion). Then add the dairy and flour as described below, for that day’s meal. Minestrone Soup – Family favorite! 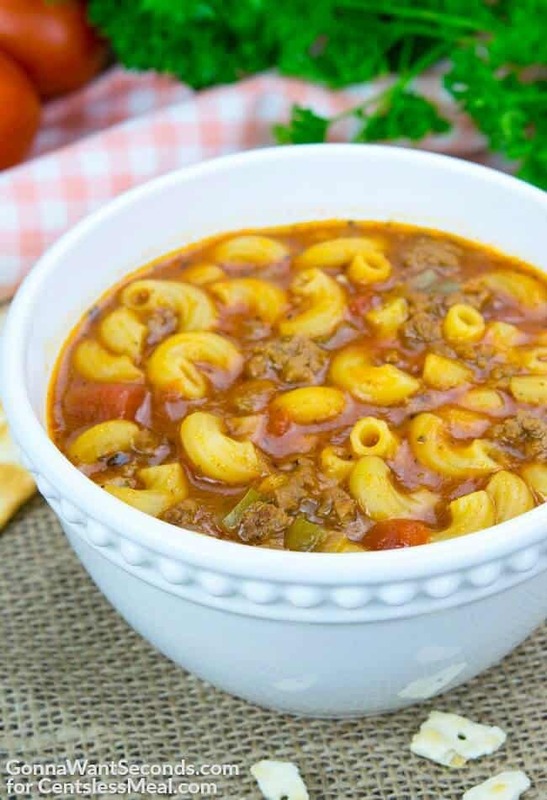 Beef and Tomato Macaroni Soup – Comfort food in a bowl! Instant Pot Beef Stew – Easy! 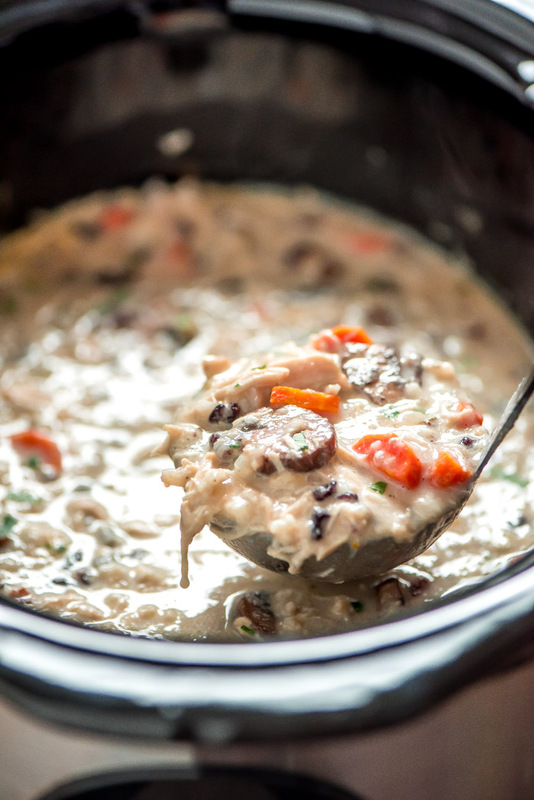 Warm up this winter with a bowl of creamy Slow Cooker Chicken Wild Rice Soup. It's easy, simple, comforting, and even loaded with lots of veggies. 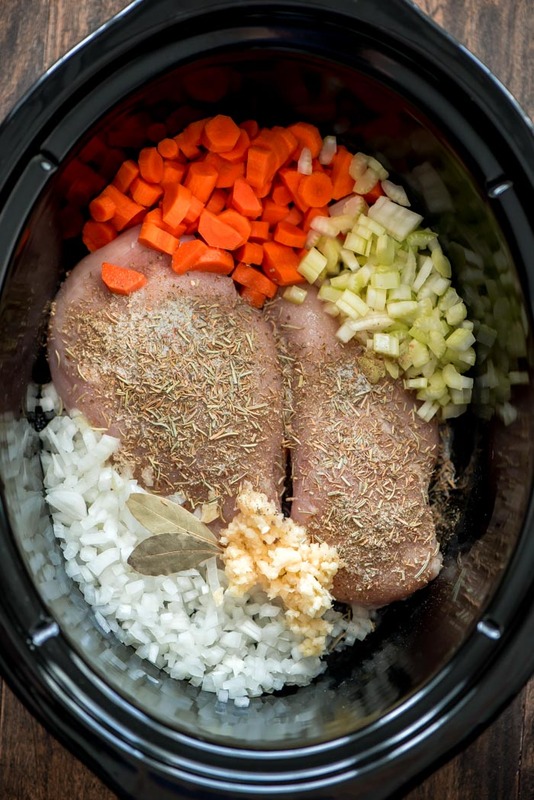 Place chicken in the bottom of a 6 quart slow cooker along with onion, carrots, celery, garlic, bay leaves, thyme, rosemary, salt, and pepper. Pour in chicken broth and cover. Cook on LOW for 3 hours. Shred the chicken, ladle into bowls, sprinkle with parsley, and serve with bread. Ladle the soup into bowls and sprinkle on some fresh parsley for color. 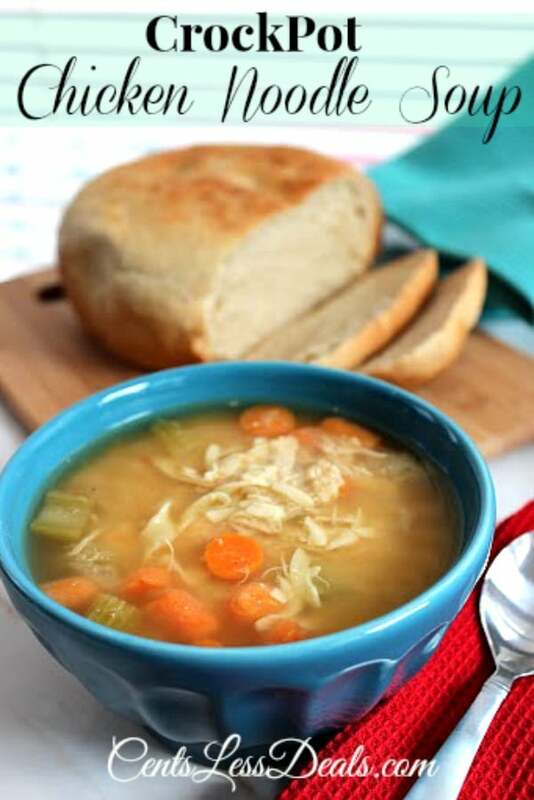 Don’t forget to serve it with some crusty bread or so you can soak up every last bit of soup in the bottom of the bowl… or you could just serve it in a bread bowl! Enjoy! If I plan on having leftovers will cooking the rice in the soup make the rice soggy when I reheat it 2 days later? Would it be better to reserve enough broth to cook the rice in separately, then just add a portion of rice to each bowl when serving? Wild rice typically keeps its texture. It should reheat well. Let us know it you try it! Kim, you could substitute other rice. It would likely take less cook time than wild rice, so you may want to add it a bit later during the cooking. Let us know how it turns out for you!